April is Alcohol Awareness Month, but you can use these plans whenever you tackle this topic. Unlike many of the drugs you look at during Drug Awareness lessons, alcohol is legal for adults and probably used in many of your students’ homes. To open your students’ minds on the subject, start by exploring some things that may not be so good for us — but are surprising or controversial. Divide the class into groups and have each group research their topic and prepare a 5 minute report for the class. Ask students to use at least five sources, including sources from the current year or quarter. 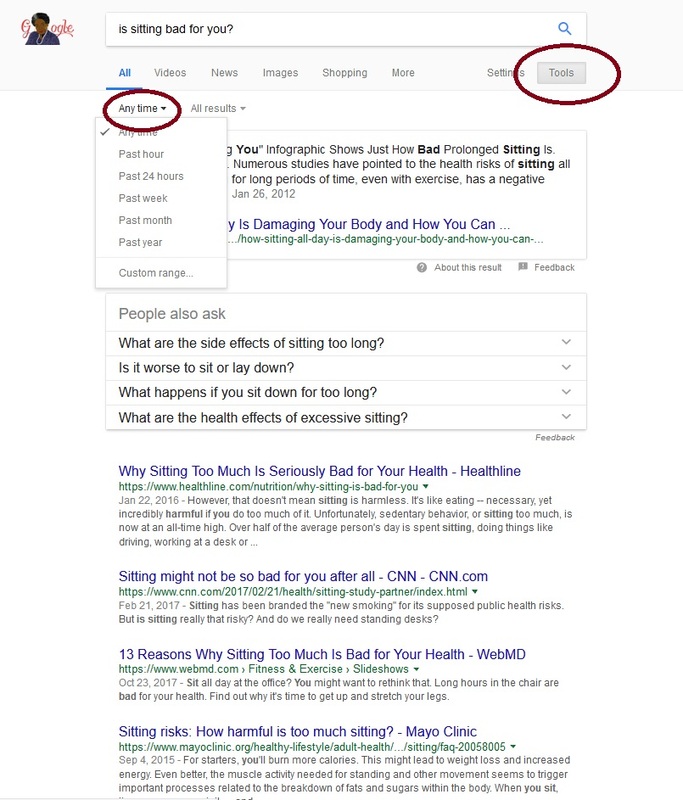 This is a perfect opportunity to learn about more advanced search options, like using the Tools menu to choose how recent you want your results to be. The screenshot below shows how. You can click to make it larger. Students should try to determine whether there is real controversy over the topic they’ve chosen. Is it that medical experts agree but bloggers don’t? Is there new research, and some people have not yet learned about it? Is there some wishful thinking going on? Our Logic Lesson Plans can help students distinguish good evidence from opinions. After the reports have been presented, research the effects of alcohol as a class. Is there real controversy on this subject? Is underage drinking a different situation from alcohol use by adults? The Alcohol Education Trust has worksheets and a lesson plan on the effects of alcohol — from “just a few drinks” to ongoing use. Discovery Education has information on the effects of alcohol on the brain. Don’t Bottle It Up has an easy-to-read page on the effects of long-term alcohol use, including information on alcohol’s connection with cancer. According to the Washington Post, 30% of Americans don’t drink at all. Another 30% drink less than one drink a week. But about 10% of Americans drink more than 15 drinks a week, and another 10% have a startling 74 drinks a week. Ask students where they plan to be on the chart as adults — chart the answers. This can be a good practice in using charts and visual representations of data. As a class or in small groups, discuss what you’ve learned from studying about alcohol use. Work through Canva tutorials or just run through the Posters page together. Choose a template design or start from scratch. Take some time to explore the tool and get a sense of how to make posters. Choose the most surprising or the most important fact you’ve learned. This will be the subject of your poster. Examine example posters at Canva.com to see how many words will be needed for the poster text. Open a new poster design. Sign up as a student. Create the poster with your text and choose graphic elements that make your point. Print it out and put it on your bulletin board or add it to the class Pinterest board. Tagged high school, middle school.